Cartoonist F.W. Parks was employed by the NEA syndicate from 1918-1921 and produced a spate of unmemorable series, of which Betty and her Beau was the last. It began on October 27 1920 and ended sometime in 1921. The end date is unclear -- the NEA archives at Ohio State University are incomplete for 1921, so the best I can do is that it ended sometime in the second quarter. Checking newspapers that ran NEA material is inconclusive since this strip tended to run ROP -- I've seen it running as late as September. 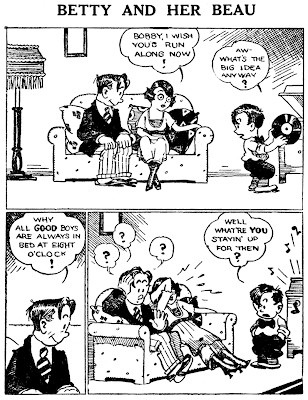 Betty and her Beau is a pretty straightforward copy of other 'pretty girl playing the field' strips of the time, like Polly and her Pals, Petey Dink and Bedelia's Beaus. Though predating the era when every second strip seemed to be about a flapper, they shared the same sensibility, heralding (and ridiculing) the arrival of the liberated woman. Cartoonist Parks certainly didn't add anything to the genre. His strips, drawn in the basic Landon School bigfoot style, have gags that seem to be cribbed from the competition and almost invariably end with that hacky 'falling out of the panel' pratfall. I once saw a page full of Krazy Kat dailies, and even George Herriman felt he had to have characters falling backwards at the end. I think that was the comic strip equivelent of a laugh track. Hello, Allan--What I find just as "hacky" (and quite dull) today is the deadpan stare at the reader in the last panel in modern strips.----Cole Johnson. 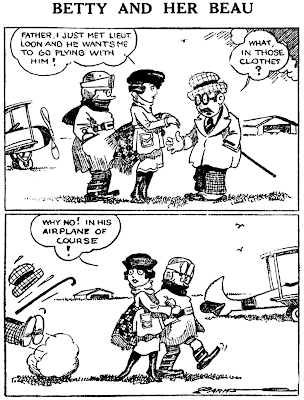 The early newspaper comic strip was a steaming, stinky soup of racial stereotyping, and if you follow this blog long enough you can bet eventually it'll feature a strip that will offend your ethnic group, no matter what it might be. Today we have one that goes after the Filipinos. Now you might think this is a rather obscure ethnic group in the U.S. to be picking on, but keep in mind that we had ourselves a little jingoistic war in the 1890s that put us sort of in charge of that nation all the way over on the other side of the globe. The Philippines were very much in the news in the 1900s and a smattering of comic strips did their part to promote disharmony between the peoples of the two nations. I think Frank Crane, the creator of Philly Peno and Koko, thought he was terribly clever for coming up with the title. It was done for the Philadelphia North American, y'see, so the Philly part has a double-meaning that ... okay, it's not funny or clever at all, but I think it tickled him. The strip ran from February 18 to May 27 1906 -- perhaps after four months someone in the bullpen finally told him that it was a pretty lame bit of punnery. As you can see from the samples, the strip didn't comment on the recent wars or really have anything to do with the Philippines particularly. Last I checked they don't have giraffes there, anyway. What we have is a mischievous kid and his pet monkey doing some pretty standard turns on the jungle theme, a favorite genre in the early days of newspaper strips. Other than some interesting panel design the strip has nothing at all to recommend it. Tip of the hat to Cole Johnson for the samples. And if you hope to see more anytime soon from Cole's collection take a moment to send some positive thought waves to his computer -- it's been giving him fits lately. I'm looking at these pages wondering if there's a little Feininger influence here ... Any thoughts? This feature slightly predates Feininger's strips in the Chicago Tribune, but I suppose Crane might have seen Feininger's work in European publications. But do I see a resemblance? I'd have to say not terribly much. 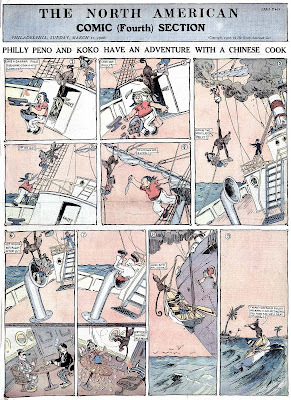 Crane was generally not very interested in unusual camera angles or page design in his other strips, so he was certainly influenced by something on this strip; if I had to guess at the influence I would look to McCay's new strip Little Nemo, started mere months before. Stereotype double trouble: not only a Filipino brat but a "Chink" cook. What I find most interesting is that the monkey can talk but the kid can't (or doesn't choose to, anyway). As you suggest, Crane seems simply to have dropped an ethnic character into a generic strip using settings and jokes he was already comfortable with. Certainly he made no attempt to research the Philippines (I lived there as a kid and I didn't see a single giraffe). Thanks Allan. I suppose I saw the Feininger influence due to the seafaring nature of the first sample. If there is any at all, I agree, you can't see it ... but whether that's due to lack of intent or lack of talent I don't really know. The McClure Syndicate's Sunday funnies section had a real taste for 'rube' strips. Here's one of the longer-running ones, Uncle Pike. A.D. Reed started the strip on May 25 1902 as Mr. and Mrs. Pike of Pike County, and soon reduced the title to the more manageable Uncle Pike. Reed stopped signing the strip in late 1903, but that doesn't mean he stopped doing it -- Reed seemed to have an aversion to signing his work. 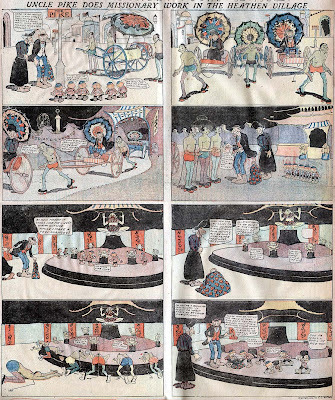 Ed Carey did substitute on the strip for at least a few 1903 episodes, and by the time the strip was winding down in 1905 the art was starting to look, to me at least, a lot like the work of J.R. Bray. Uncle Pike went into retirement after October 29 1905. "Nutcracker U. "—a funny strip about an incredible college run by a wealthy man—is John Pierotti's stepping-stone to a new phase of his career. Explaining that his feature has been out for a month, beating the gun on the present rush to collegiate humor, Mr. Pierotti confided to this department: "I did it all myself. I am syndicating it, too. That means footing all the bills, and when a cartoonist does that, he either is crazier than most cartoonists, or he believes implicitly in his product. The latter part of that sentence applies to me." John broke into newspaper work as a copy boy on the New York Telegram in 1927. He took up illustrating for sports and news events, turned to drawing Old Gold contest cartoons, and then became a staff artist with United Feature Syndicate — all within 10 years. In 1938 he was drawing King's comic strip, "Hippo & Hookie." He started a sports cartoon, "Pier-Oddities," for United in 1943, switched to McClure in 1949. Norman Meyers, noted artist, world traveler and current events commentator, has been retained by the Ledger Syndicate (Philadelphia) for a series of strips and captions which will help to clarify the international news for the average reader. Called "Backgrounds," the first subject is "Korea — Buffer State. " The entire history of the war-stricken country is told in four-panel sequences with capsule commentary, running about 40 words to the panel. Each subject will be covered in four weeks. Already scheduled for early release are "Formosa — Defense Link" and "MacArthur—Destiny's Soldier." The syndicate advises that schedules may be changed to keep the feature topical. Any new area threatened by aggression would be covered immediately. "Dawn O'Day in Hollywood," a Chicago Tribune-New York News comic strip initiated a year ago as a Sunday color feature, will go on a daily basis Sept. 18. 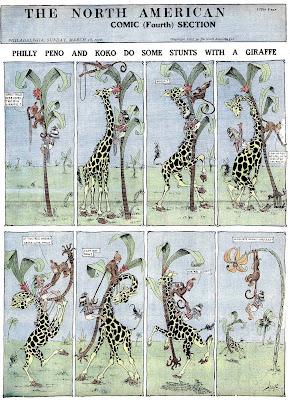 Now syndicated in 15 newspapers, the strip is drawn by Val Heinz, 23, the youngest of the CT-NYN's cartoonists. Mr. Heinz, a native of Streator, Ill., worked in Florida as an assistant to Frank King for four years before becoming a student at the Chicago Academy of Fine Arts. Newly formed Fun Features Syndicate, 1311 Widener Building, Philadelphia, will specialize in the one- and two-column humorous type of material, according to Editor F. H. Phillips. Original offering (Sept. 30 release) is a four-column gag cartoon strip, "Dizzy Daze," by Mr. Phillips. Thomas Crawford Hill, newspaper artist and cartoonist for many years, will launch a weekly cartoon strip, "Sketches From Life in Glendale," for the Glendale (Calif.) News-Press and also will serve as staff artist. Mr. Hill, who now resides in Glendale, formerly was chief staff artist of the Cleveland (O.) Plain Dealer, executive art director for McNaught Syndicate and Central Press and for Toledo (O.) Blade. He also drew cartoons four years for late Arthur Brisbane's column and George Matthew Adams Syndicate. 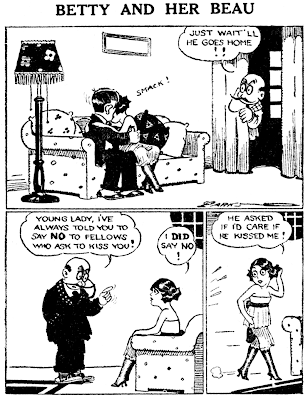 A. S. Curtis Features Syndicate, Washington, D. C., offers "Sunny Sue," column-wide cartoon-verse feature. Rhymes of the pigtailed youngster are written by Edna Markham of Hollywood. Calif., who has published verse in a Los Angeles daily. The cartoonist is Jack Fitch of Philadelphia who ran a similar feature "The Tenderloiner" in the Washington (D. C.) Daily News and other papers. 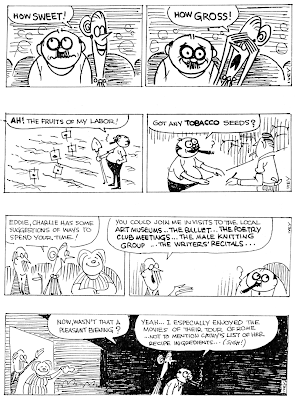 HIPPO was a circus strip written by Elliot Caplin (Hippo was a strongman). I have seen a strip (copyright 1938) reprinted in a NCS album with Pierotti bio. LA Times 9/17/1950 p 1 (ProQuest Hist Newspapers), has an article describing the debut of a new strip "Dawn O'Day" tomorrow. Chicago Trib, 9/18/1950 p 1 (ProQuest Hist Newspapers), has an article describing the debut of a new strip "Dawn O'Day" that day. Hill died 11/15/1951 in Gledale. Thanks for the cites on Dawn O'Day. Case closed! I guess Tom Hill's local feature was quite the short run at best. Can someone tell me if joining ProQuest is worth the money. They have some of the larger papers I have been looking for. As far as I know, the Proquest service is basically available only to libraries. It is so expensive that few libraries can even afford to have access to all Proquest's newspapers; they choose only the most important. The black papers,for instance, are available at very few libraries. 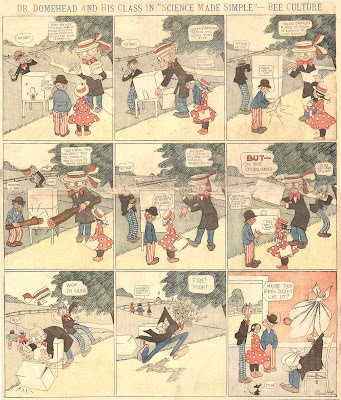 This is one of Walter Bradford's earliest strips for the Philadelphia North American, the paper that would be his home for the next couple of decades. Bradford wasn't much of an artist, but he made up for the deficiency by having an inspired sense of playfulness, and sometimes out and out lunacy, that can't fail to induce chuckles. Amazingly enough, Bradford never seemed to wind down; his later work was just as fresh and high-spirited as his early stuff. Doctor Domehead, usually subtitled Science Made Simple, is one of the many 'nutty professor' strips that were so popular in the early decades of the funnies. It ran from March 5 to June 25 1905. Tip of the dome-warmer to Cole Johnson for the scan.